Pioneers in the industry, we offer pp woven bags for food packaging industry from India. 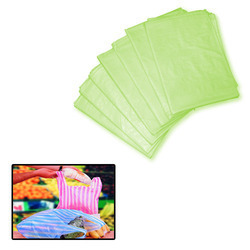 We have carved a niche by offering a wide assortment of PP Woven Bags for Food Packaging Industry. Our provided woven bags are well designed by our experts using best quality material & leading techniques in sync with the standards of quality. These woven bags are offered in diverse sizes & customized options in order to satisfactorily fulfill specific needs of our clients. Offered woven bags are high on demand in the market for its high strength & quality.